In June 2018, SMU Libraries uploaded 1,388 items into SMU Libraries Digital Collections. 60 documents, ca. 1909-1940s, into the Texas: Photographs, Manuscripts and Imprints digital collection as part of the TexTreasures FY2018 grant program, sponsored by the Texas State Library and Archives Commission and funded by the Institute of Museum and Library Services. Where crops never fail, ca. 1918, DeGolyer Library, SMU. These documents feature promotional literature from the early 20th century that encourages further settlement and development of Texas, focusing on both metropolitan and agricultural regions. Works promoting the smaller cities of Bonham, Floydada, Hamlin, Hereford, Mission, Pampa, Plainview, Port Isabel, Sherman, Spearman, Stamford, Three Rivers, and Yorktown focus on the availability of homes and land, the cities’ potential for growth, local industries, and local agricultural conditions and opportunities. Many of the promotional pamphlets published for these cities were issued by town site companies, municipal organizations, and chambers of commerce. Other cities highlighted include Amarillo, Austin, Boerne, Dallas, Edinburg, El Paso, Ft. Worth, Galveston, Hamlin, Houston, La Porte, Pampa, Paris, Plainview, Port Arthur, Throckmorton, Weslaco, and Ciudad Juarez, Mexico. Of special note is The Lone Star State’s Door to the World, which explains why the federal government deepened the channel and harbor in Galveston; how these improvements reduced ocean rates, port charges, marine insurance, and railroad rates; the benefits of deepening the Galveston port to other states, especially in the West and Southwest; the expansion of wharves and wharf sheds to protect cargo; why Galveston commerce grew 882% as a result of deeper channels and harbors; the adaptability of the Galveston port for future expansion; the construction progress of the Causeway; the construction process of the seawall; and plans for a seaside hotel and resort. Bridwell Library exterior, Bridwell Library Special Collections, SMU. 328 photographs and documents were added to The History of Bridwell Library collection spanning the 1950s-1990s. 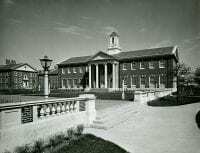 The collection includes photographs of the library after opening in 1951, the 1972-73 addition of the Bridwell Annex, the 1988-89 expansion and renovation, and noteworthy library events. Gardenias and Velvet, Remodel No. 17, 1935, Bywaters Special Collections, SMU. 33 fashion design sketches (plus one front cover), 1930s-1940s, were uploaded into the new Jake and Nancy Hamon Papers digital collection. Beloved Dallas philanthropist Nancy Hamon was also a talented artist, designing and redesigning her own takes on women’s fashion and haute couture in the 1930s-1940s. Highlights of this sketchbook include several pages, like this one, featuring multiple unique designs. 29 engravings, ca. 1820-1820, from Reise nach Brasilien in den Jahren 1815 bis 1817. This volume includes the prints from the German prince Prinz Maximilian von Weid’s travels through Brazil in 1815-1817. Prinz Maximilian extensively documented his travels, especially his interactions with the native peoples of the area. Thus, most of these engravings depict native peoples, their belongings, and the areas they inhabited. 5 photographic prints, ca. 1892-1936, from Oklahoma locations and oil production photographs. These images depict oil fields, mills, and cattle drives across Oklahoma. 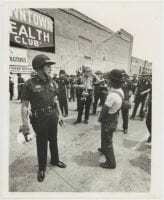 [Dallas Police Officers and Demonstrator, March of Justice for Santos Rodriguez], July 28, 1973, DeGolyer Library, SMU. 39 images, taken by Andy Hanson on July 28, 1973, at the March of Justice for Santos Rodriguez. These images, which were primarily taken in downtown Dallas near City Hall, show the demonstrations which arose in the aftermath of the death of Santos Rodriguez, a 12 year-old boy who was shot in police custody in Dallas four days before the march. Many of the images are contact sheet strips, depicting scenes of demonstrators with protest signs, local press and spectators, and masses of demonstrators gathered outside of the Dallas Municipal Building. This set of items contains a number of noteworthy images; one particularly striking photograph shows a march participant standing amid a group of police officers. Tajn [sic] voladores. 17 of 36, DeGolyer Library, SMU. 97 color slides, 1948 and 1963, were added to the Isabel T. Kelly Ethnographic Archive. Highlights include 15 images of people performing the “Los Negritos” traditional folk dance, and 37 images of the high-flying acrobats known as “voladores” performing at the Corpus Christi festival. The slides were taken on two separate trips, one in 1948 and one in 1963. 25 postcards, ca. 1910-1920, from American border troops and the Mexican Revolution. The postcards were mostly taken on the Mexican-American border region from 1910-1920, depicting events from the Mexican Revolution and the Border War. Many of the postcards focus on rebel leader Pascual Orozco and the Battle of Ciudad Juarez. 770 issues of The Daily Campus, SMU’s student newspaper, from 1990, 1991, and 2010-2018. Highlights include articles on the groundbreaking and opening of the George W. Bush Presidential Center, centennial celebrations, and visits to campus by Katie Couric and Khaled Hosseini. Mandalas: Dean Joseph Quillian, Bridwell Library Special Collections, SMU. Mandalas: Dean Joseph Quillian is currently on view in the Entry Hall of Bridwell Library through August 19, 2018. As a young person Dean Quillian began drawing freehand doodles with a “love knot” motif, adding circles in the 1950s. 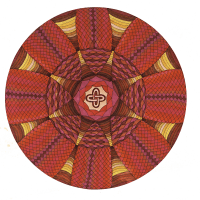 Through the writings of Carl Jung, he learned that his “circles by a square” were mandalas. According to Jung, creating mandalas is a symbolic way of bringing order out of chaos and achieving unity in life. To Quillian, drawing geometric designs was an unconscious form of self-expression. He found drawing while attending meetings and conferences allowed his mind to focus more clearly on the topics of discussion. Bookbinding proposal by David John Lawrence, Bridwell Library Special Collections, SMU. Bridwell Library’s triennial bookbinding competition is named for Helen Warren DeGolyer (1926–1995), a well-known supporter of the arts and education in Dallas, as well as a skilled devotee of design bookbinding. Following her testamentary wishes, her brother, Joseph Warren, and her children, Everett Lee DeGolyer and Edith DeGolyer, established in 1996 an endowment to support a triennial bookbinding competition, exhibition, and conference on the contemporary book arts to be held at Bridwell Library. On view in the Prothro Galleries through July 13, 2018. This entry was posted in Dallas, History of Bridwell Library, Isabel T. Kelly, Mexico photography, SMU Student Newspapers, TexTreasures2018. Bookmark the permalink. Love the fashion design sketches in the Jake and Nancy Hamon Papers digital collection.